Welcome to the Maternity Center at the Elliot Hospital. We are proud to assist you in your childbirth, a time special for you and your family! With this mission in mind, we offer you maternity care excellence based on the latest research. 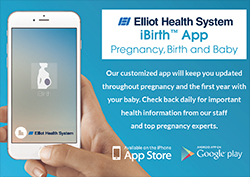 During your pregnancy, we offer you the Elliot Health System iBirth App! The Elliot iBirth App is great for daily health information about your self-care and planning for your baby. Look there for the latest information on all kinds of topics about pregnancy, labor, birth, breastfeeding, baby care and safe sleep, car seat safety and many other important topics. This app starts at the beginning of your pregnancy, through birth, postpartum and through the first year of your baby’s life. Information is on hand and in hand, 24 hours per day. No adds, no commercials, no links to outside businesses or marketing firms. Just really great information about you and your baby, from national and local health experts. You receive access to this app through your OB doctor or midwife, so be sure to ask at your next appointment! Our specialty trained board-certified physicians and certified nurse midwives have access to additional Elliot Hospital specialist in high-risk maternal-fetal care, anesthesiology, neonatal intensive care. Should you need them, our nursing specialists in our regionally acclaimed programs of lactation, postpartum depression, and bereavement are on staff and immediately available. You deliver your baby. We deliver comfort, safety and security. Your nurses will help you heal from your birth in the safe and secure Maternity Center. Elliot Hospital controls access to Labor and Delivery and Maternity and has a state-of-the-art infant security system. A safe and comfortable suite for you to recover from your birth while you learn about your new baby. Comfort, safety and security. This is our delivery to you when you deliver your baby with us. If you would like to know more about rooming-in and why, at the Elliot, we provide mother-newborn care together, click here. 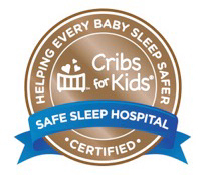 Elliot Hospital was recently recognized by the National Safe Sleep Hospital Certification Program as a Gold Level Hospital for its commitment to best practices and education on infant safe sleep. Elliot Hospital is the first hospital in NH to receive this title. Welcome Newborn is a studio photography service here in the Maternity Center at the Elliot Hospital. A photographer will come to see you in your room. She will take beautiful pictures of you and your baby that you can then buy. If your baby is in the Newborn Intensive Care Unit, speak to the photographer and she can arrange for photos taken there if you would like that. Compassion, care, healing and wellness. These are the ways that we serve you when you have your baby with us.